This page will introduce a partition tool with which you can expand the size of FAT32 system partition without rebooting Server 2003. Download IM-Magic Partition Resizer Server to extend system partition without rebooting when it has no enough free space on Windows 2003. Many people have encountered with the low disk space problem on Windows PC, while Windows 2003 users are one of them. When you receive low disk space problem on Windows 2003 system partition, you may try to uninstall some programs to free up disk space. Now, you can use the partition software IM-Magic Partition Resizer Server to increase the size of system partition on Windows Server 2003 without deleting any files. You can use this software to extend and shrink partition whether it has FAT32 file system or NTFS file system. You need to move the unallocated space close to system partition. Then, you can right click system partition and select "Resize/Move" option. Add the unallocated space to the system partition and then click "Apply" button. "The FAT32 system partition on Windows Server 2003 is running out of disk space and Windows keeps reporting the low disk space warning message to ask me to delete some unnecessary files to free up disk space I know that it is possible to increase the size of system partition with some method, but I don't know how to do it. I don't want to delete any file or repartition hard disk. Can anybody recommend any solution for system partition extending on Windows Server 2003 without repartitioning hard disk or rebooting PC?" 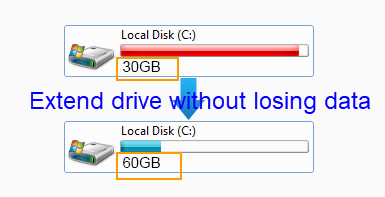 "I want to know how to fix low disk space on C drive system partition in Windows Server 2003, but many people say I need to reinstall system and repartition hard disk to reallocate more space to the C drive. However, I don't want to do such a complex task. I am wondering is there is any tool that I can use to resize hard disk easily without any influence on disk data or operating system? The C drive has FAT32 file system." How to Extend FAT32 System Partition Windows 2003? When you boot your computer or when you install a program on your PC, Windows may pop up low disk space warning message to alert there is no enough free space on C drive system partition. In addition to deleting files, is there any other way to fix the problem? Well, only a professional partition tool can help resize disk partition so as to fix low disk space problem on any partition on your computer. IM-Magic Partition Resizer Server is such a partition tool, which is able to increase the size of system partition with operating system untouched. No matter the system partition has NTFS or FAT32 file system, you can rely on this software to expand the size of the partition easily. This partition software supports Windows Server 2003 and other Windows Servers. FAT32 and NTFS file system have some differences. 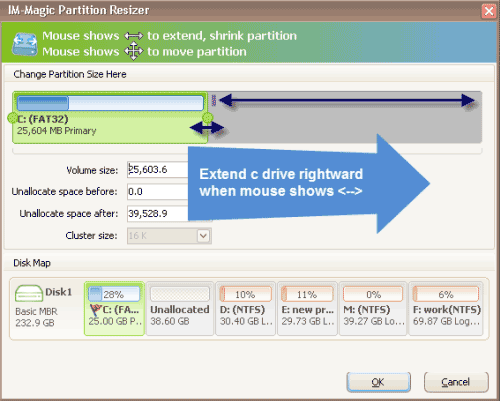 Although you can find many partition tools for system partition resizing, IM-Magic Partition Resizer Server enables you to increase the size of system partition without rebooting your commuter. It sounds nothing, but it can save much time without rebooting your PC. By using this partition software, you only need to perform a few mouse clicks and drag the mouse, so that you can easily get FAT32 system partition extended.You can also merge partitions to c drive on server 2003. Without rebooting your computer, you don't need to worry that it causes any hurt to your operating system during rebooting. If the computer reboots automatically due to unknown reasons in the partition resizing process, it does no harm to system or disk data. Deleting or moving files can free up disk space, but it is not a good solution to fix low disk space problem on system partition. On the one hand, if you only delete some unnecessary files, it cannot free up much disk space. On the other hand, if you mistakenly delete some important data, it may affect the performance of your computer. Therefore, you had better not delete files to free up disk space on system partition. Instead, you can use the partition software to increase the size of system partition on Windows Server 2003 or other Windows Servers.